The Colibri Tweak is a free tool which allows you to adjust a lot of system parameters of the Colibri module. On the Colibri T20 and Apalis/Colibri T30, only a limited number of features are currently supported. Change the Colibri's serial number. Do this only if the serial number was lost for some reason! Screenshot of the Memory Timings dialog. On this page you can change the Flash Layout or do backups of flash regions. We recommend to use the Update Tool Version 3.1 or newer to do backup of the flash regions. 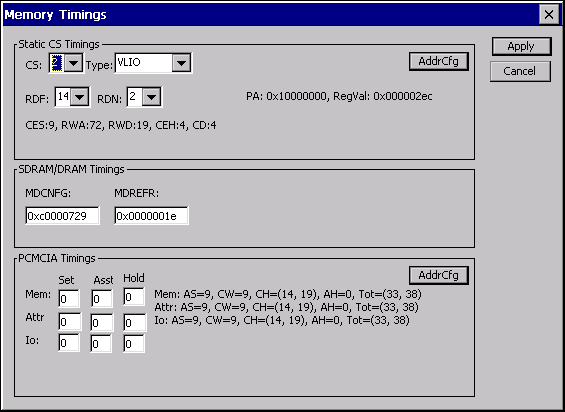 This dialog is used to directly read and write to physical addresses of the PXA processor. In this tab you can adjust the settings for the display driver. It is also possible to adjust this settings directly in the Registry but it is more comfortable with the Colibri Tweak. You can find more information about the corresponding registry settings in the article Display Driver Registry Settings. To make your changes permanent, you need to save the registry. Active          Check the box if you are using an active display. Monochrome      Check the box if you are using a monochrome display. DualPanel       Check the box if you are using a dual display. BPP             Specify the bit per pixel which is used in the internal frame buffer. Standard is 24 BPP which allows the best color resolution. See also: Framebuffer. LDD             Specify the number of data lines which are used to connect the display. The maximum is 18 lines. To get the best color resolution use 24 BPP and 18 LDD. See also: Framebuffer. HsyncPol        Polarity of the Hsync signal. VsyncPol        Polarity of the Vsync signal. PClockPol       Polarity of the pixel clock signal. OEPol           Polarity of the output enable signal. 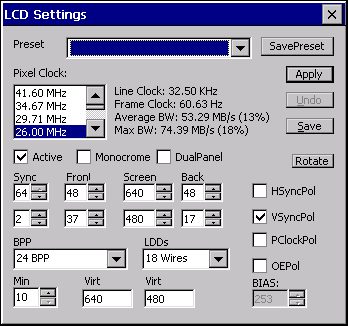 Pixel Clock     Configure the pixel clock frequency. 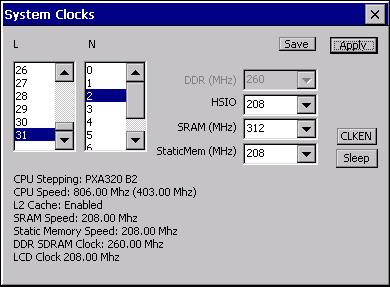 Min             Warning level for the minimum frame clock frequency. 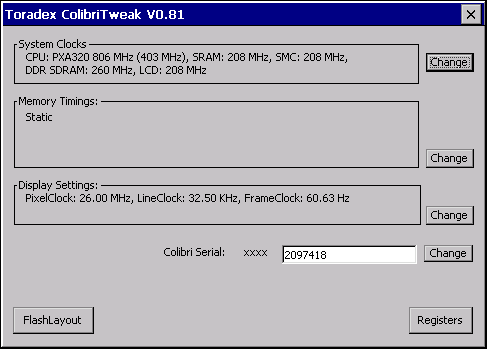 This parameter is used only within Colibri Tweak and does not affect any display settings. in your display datasheet. See also Display Driver Registry Settings. Front           Beginning of Line/Beginning of Frame Pixel Clock Wait Count. (Back Porch in clocks. Yes, our "front" is the back porch). You should find this value in your display datasheet. See also Display Driver Registry Settings. Screen          Here you can set the resolution of your display. Back            End of Line Pixel/ End of Frame Clock Wait Count. (Front Porch in clocks. Yes, our "back" is the front porch). You should find this value in your display datasheet. BIAS            Bias value, used for passive LCDs only. SavePreset      Save the current display settings to a .reg file. Preset          Here you can choose a display preset. The display preset files have to be in a folder called "DisplayPresets"
which is on the same place than the ColibriTweak.exe. Apply           Apply the current display settings without saving the Registry. Save            Save the display settings to the Registry and save the registry to the flash memory. Please check Vybrid Display Tool. Please check iMX6 Display Tool.